John Kelly Claims Civil War Caused By Lack Of Compromise. History Shows Otherwise : The Two-Way The White House chief of staff made the remark during an interview on Fox News. Observers were quick to point out that decades of "compromise" on slavery preceded, and did not prevent, the Civil War. White House Chief of Staff John Kelly listens as President Trump speaks at the White House on Oct. 19. During an interview Monday night on Fox News, White House Chief of Staff John Kelly said that "the lack of the ability to compromise led to the Civil War." His comment was swiftly countered by confounded observers, who pointed out that the Civil War was fought over slavery and that compromising on slavery would be morally unconscionable — and that the country did strike such compromises for decades and they did not, in fact, prevent war. Kelly said he thought applying contemporary standards of ethics to the past is "very very dangerous" and demonstrates "a lack of appreciation of history." He praised the "men and women of good faith on both sides" of the Civil War who followed their "conscience" in their fight. After Kelly's remarks, scores of commentators responded with rebuttals, their tone ranging from bafflement to shock to weary repetition. John Podhoretz, the conservative editor of Commentary magazine, wrote on Twitter, "80 years leading up to the Civil War were a history of efforts to compromise with the South. And then the war came. Started by the South." The Civil War started because of the expansion of slavery not the failure to compromise. They’d literally been compromising on slavery since the Declaration of Independence. As Vann Newkirk, a writer at the Atlantic, put it succinctly, "the entire fabric of American law was a compromise with slavery." The idea that the Civil War was caused by a failure to compromise was expressed by historian Shelby Foote in Ken Burns' 1990 documentary The Civil War. Foote, who once wrote that he "would fight for the Confederacy today if the circumstances were similar," was criticized by fellow historians for, as The New York Times put it, playing down "played down the economic, intellectual and political causes of the Civil War." Briefly: The history of antebellum America is full of concessions over the question of slavery, including several pivotal agreements with "Compromise" in the name. The Three-Fifths Compromise in 1787 determined that enslaved black people would count as 3/5 of a person for purposes of representation (while not counting as human at all, in terms of their own rights). The Missouri Compromise in 1820 maintained the balance between slave states and free states. The Kansas-Nebraska Act later replaced that compromise with a different negotiated deal, leaving the question of slavery up to individual states. The Compromise of 1850, a painstakingly negotiated package of bills, prohibited the slave trade in Washington, D.C., but also compelled Northerners to return fugitive slaves from the South to the owners they had escaped from. Each of these deals perpetuated the institution of slavery — prompting some to ask if Kelly was suggesting that America should have permitted slavery to continue in the name of compromise. "Compromise on what?" asked Joshua Zeitz, a historian and the author of Lincoln's Boys, asked on Twitter. "Extending chattel slavery throughout the western territories?" "The only compromise on the table in 1861 would have given slavery explicit constitutional protection," writes Jamelle Bouie, chief political correspondent at Slate. "Focus on compromise only makes sense if you view slavery as bad but not *that* bad," Bouie later wrote. 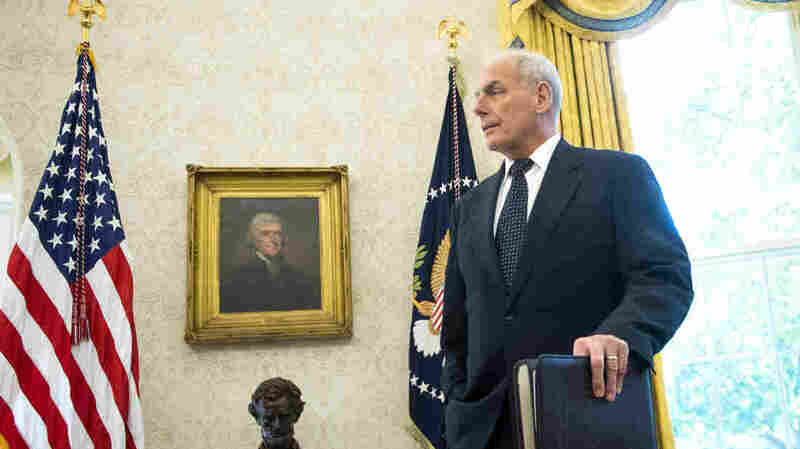 Author Ta-Nehisi Coates, in a widely shared thread on Twitter, said that the historical inaccuracy of Kelly's statement extends further than ignoring the actual, explicit "compromises." "Lincoln's own platform was a compromise. Lincoln was not an abolitionist. He proposed to limit slavery's expansion, not end it," Coates writes. "During the Civil War, Lincoln repeatedly sought to compromise by paying reparations — to slaveholders — and shipping blacks out the country. And after the war was over, he notes, the Compromise of 1877 "led to explicit White Supremacist rule in the South for a century ... As historian David Blight pointed out "compromise" with white supremacy was how the country achieved reunion." Coates also directly rebutted Kelly's assertion that "we make a mistake ... when we take what is today accepted as right and wrong and go back 100, 200, 300 years or more ... and apply it back then." The "notion that we are putting today's standards on the past is, in itself, racist — implies only white, slave-holding, opinions matter," Coates writes. "Majority of people living in South Carolina in 1860 were black — they did not need modern white wokeness to tell them slavery was wrong. Majority of people living in Mississippi in 1860 were black. They knew, in their own time, that enslavement was wrong." In the interview, Kelly also said he stands by his comments about Rep. Frederica Wilson, the congresswoman he accused of bragging during a memorial for fallen FBI officers about funding she obtained for an FBI building. Video footage showed that Kelly's allegations were false. After Ingraham played a montage of clips, omitting the praise Wilson gave others and highlighting moments when she used the word "I," Kelly said he didn't want to explain exactly what he was referring to with his allegations — "Don't want to get into it," he said — but that he does not feel any need to apologize for them.